You answer! LOL :) Every year Pottery Barn selects only four stylists to participate in their Mystery Box styling challenge. I'm thrilled that Capes & Crowns will be participating this year! Talk about an amazing opportunity. 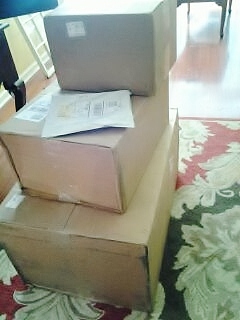 I am more than a little excited about this. Here's how it works. You are sent several boxes of surprise merchandise from Pottery Barn. You get to KEEP these items afterwards! We can stop right there bc thats an award in and of itself right?! You must style a set up with the items. You are allowed to use any items in your home as well as $50 visa gift card thats provided to you for the purchase of additional items you may need. Having to stick with a minimal budget is always a challenge but sense this is for Pottery Barn it will be more clean lines and less fluff so I definitely think its doable! The other big challenge is the theme. Summer cocktails. UGH. I'm not a drinker so I definitely had to do my research. The participants were also allowed to chose between a couple of items on the merchandise list. The few items chosen allowed me to develop a theme (you know how I adore a theme) and I'm going with a coastal/nautical set up. Danielle will be shooting it day after tomorrow in my moms outdoor kitchen. This is a contest that fans can vote on once Pottery Barn posts them on their webpage. It will go live in June so please stay tuned and I'll provide the voting links!!! 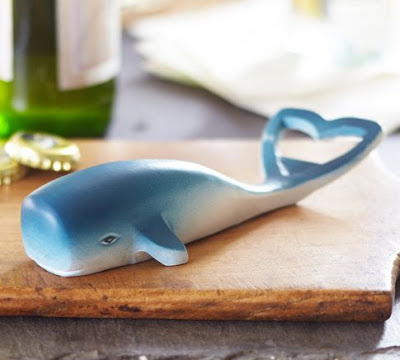 I will go ahead and share one small element of my set up :) I was able to chose which bottle opener I wanted and I chose the adorable little whale. This guy, will call him Barn ;) was where my inspiration took off for my theme. I had Mama Fresh make a cake topper in his likeness! Super cute right! ?